As this writers time in Wyoming continues, the passion for good food flourishes. Most of my articles are of the foodie nature, and this one follows suite. Tucked downtown in this quaint western Wyoming town, Coyote Creek Steakhouse and Saloon is a pleasant dining surprise. The evening passes in a wonderful atmosphere where food, service and good memories all mingle together. Coyote Creek Steakhouse and Saloon is located at 404 N Street. (At first I thought “N” in N Street was for north, but it’s not, it’s just an “N”). The hours are great, Monday through Friday from ll a.m. to 10 p.m., Saturday 4 p.m. to 10 p.m. Unfortunately they are closed Sunday. 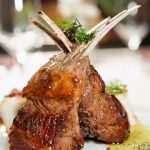 The Steakhouse is family friendly and casual even though the atmosphere is that of a fine dining experience. The service is exceptional, the seafood is always flown in fresh, desserts are homemade and there are nightly chef specialties. Appetizers include but are not limited to the usual of onion rings and mozzarella cheese sticks, however, they serve a beer battered asparagus that is to die for! The Maryland crab cakes rival those in Ocean City Maryland, and the gulf shrimp cocktail takes me back to Galveston Texas. The homemade mac and cheese reminds me of my childhood. Yum! Entrees come with a house salad or soup of the day, (I recommend the French Onion Soup) as well as a choice of potato and vegetable of the day. Being a beef/burger person I have to admit there steaks are exceptional and grilled just to order,– but,– the Sesame Encrusted Ahi Tuna is where foodie dreams come from! In general prices are reasonable, appetizers around 9.00, and keep in mind the portion size allows for sharing. Sandwiches such as the Philly Cheese Steak or Buffalo Burger will run between 9 to 10.00, but oh so worth each bite(! ), and could be shared for a romantic luncheon. Average Entrees are around 25.00, but the delicious Steak Kabobs with bell pepper, onion and mushrooms with your choice of sauce is only 13.00, so there is a good price range for any budget, even if you are just registering a Wyoming business. Rock Springs Wyoming has stolen my heart. This town is well worth the stop-over when traveling out west on Wyoming Interstate 80. Take exit 102, Dewer Drive and follow it around to the intersection of N street where Coyote Creek Steakhouse is waiting to warm your traveling tummy, ya just gotta try it, you’ll be hooked like I am!